Heat oven to 350°F. Spray shallow 2 1/2-quart casserole with cooking spray. In medium bowl, mix flour, brown sugar, pecans, butter and cinnamon until blended. 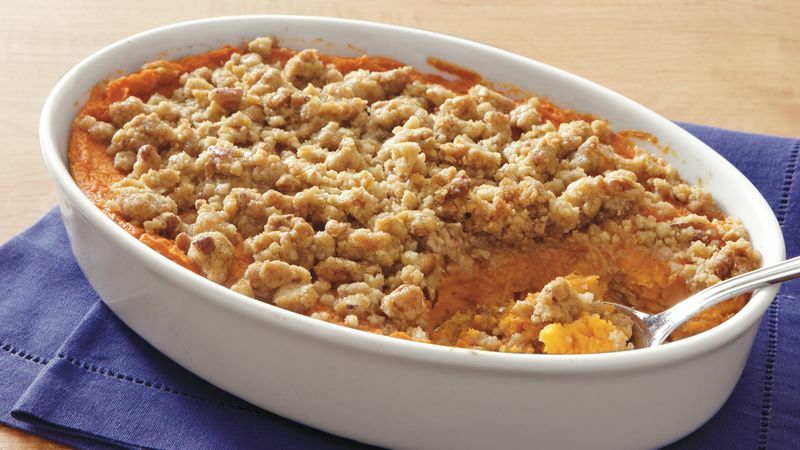 In large bowl, mix sweet potatoes, vanilla and 1/2 cup of the streusel mixture. Spoon sweet potato mixture into casserole; sprinkle with remaining streusel mixture. Bake uncovered 45 minutes or until thoroughly heated and streusel is crisp. Toasting pecans and other nuts brings out their flavor. To toast pecans, spread in ungreased shallow pan. Bake uncovered at 350°F 6 to 10 minutes, stirring occasionally, until golden brown.